This is the first post on the new blog. I don’t plan on making a big deal out of it but I figured I’d get the regular readers of the older blog up to speed with the new site. I figured it could also be helpful to give new readers a quick primer on what this site is all about. The vast majority of study advice given to students is downright awful. There is a constant blare of people recommending “study more,” “work harder,” and all kinds of other silly advice that usually just leads to worse results because it kills motivation. 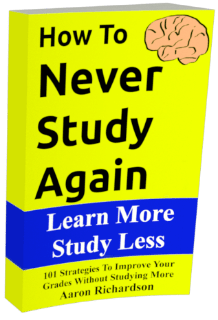 Millions of students are bombarded with this terrible advice, often because the people recommending it never learned anything better for themselves. Studying is a skill that can be developed. This blog is dedicated to helping students develop that skill. In the last few decades there have been countless studies on how to develop this skill more powerfully but those recent advances have yet to be included in the traditional advice. The studies only go so far though. It doesn’t matter how well something works in the lab. It also needs to work in the daily lives of students. These are the skills that I’ve been dedicating myself to discovering for almost a decade of my life now. Too many students get trapped in cycles of banging their heads against the wall to try to learn pointless facts that have absolutely no impact on their lives. All that wasted time is time that could have been spent learning things that are truly important to life. There is a better way. It’s possible to study in less than 15 minutes a night while scoring in the top of your class. It’s possible to have more free time than you know what to do with while acing your tests. It’s possible to enjoy a good portion of the studying that you do. This is all possible for even the most lazy of students. The fact that this section sounds like a ridiculous sales pitch is just proof of the problem. The established ideas are mind-blowingly wrong. Odds are, you’ve probably met students that have learned this for themselves. Sometimes they get great grades while hardly putting in an ounce of effort. Sometimes they’re called gifted students because of how easily they can score high. Traditional advice often dismisses these students as flukes but they’re the ones that tend to know what they’re doing. One of the biggest changes to expect on this new blog is the work of additional writers. Currently you can expect the writing of at least one new author. I discovered her work on another site and was floored to read someone that wasn’t preaching the same of study schtick. She’s also going to be taking up a good portion of the management roles on the site. Hopefully in time this site can grow to encompass even more authors. Thanks for reading the old blog. And thanks for reading this one.